There is more information available on this subject at Jupiter on the English Wikipedia. "Lord of worlds, massive Jupiter and its moons must have been a cornerstone of Golden Age civilization. But the nature and extent of human presence there is now unknown. Old records refer to cities in ice and world-spanning oceans, but perhaps this is only poetry." Jupiter is the fifth and largest planet in the Solar System with several dozen moons. It is also a living consciousness, and one of the Nine. When the Traveler arrived at Jupiter, it terraformed the surrounding moons. One of these moons, Europa, was colonized by humanity; this colony was later lost during the Collapse. Another moon, Io, was partially terraformed when the Collapse occurred. Now ice-encrusted, abandoned cities are all that remain. The survivors, however, appear to have been radically changed. Jupiter (and possibly the other outer worlds) are now governed by the Nine, a mysterious group of entities whose power is rivaled only by the Awoken Queen Mara Sov. The Nine seem to be interested in surviving human civilization and their Traveler, prompting them to send an agent to the City as their emissary. 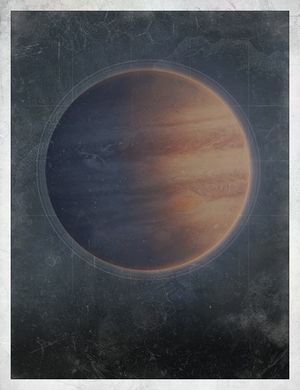 The Ahamkara are rumoured to still exist somewhere in the vicinity of Jupiter. Colorized full-disc image from Wikipedia, taken April 2014.